Spring classes at Los Angeles Harbor College begin today (Feb. 5) and there’s still time to enroll in a journalism course, or other classes, using the district mobile app. Journalism 108 (Article Writing) is Monday and Wednesday, 9:35-11 a.m.
Public Relations 001 (Principals of Public Relations) follows from 11:10 a.m. to 12:35 p.m. The Harbor Tides student newspaper course is held Tuesdays and Thursdays 11:10 a.m. to 2:20 p.m. Enroll in Journalism 218. All courses take place in the journalism lab, which is in Northeast Academic Hall 213. 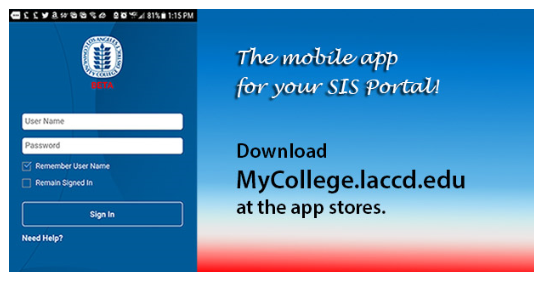 Screenshot of new LACCD mobile App. It allows students to register for classes, among other things.